With dental and facial aesthetics in mind Swann-Morton offer the versatile Fine range of handles and blades. The cutting edge expertise embodied within these blades meets the most demanding and complex requirements presented by modern day Periodontal, Cosmetic, Oral Implantology and Maxillofacial procedures. 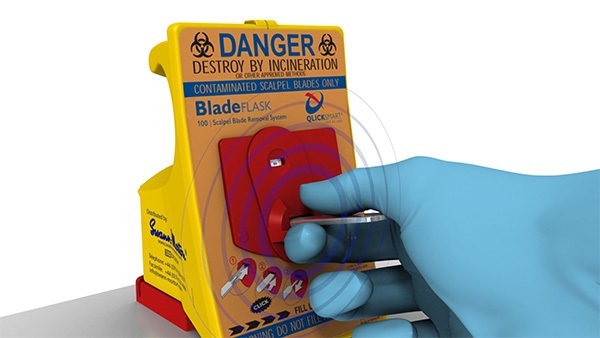 The EU Sharps Directive compliant sterile retractable safety scalpel supports existing safe passing protocols and encourages safe disposal of sharps in the dental practice. It is currently available in three blade shapes, 10, 11P and 15 which are colour-coded for ease of recognition. The single use sterile blade remover assists in the safe removal of a contaminated surgical blade from the traditional metal surgical handles whilst the Cygnetic range combines a thicker stainless steel blade with a special innovative handle which grips the blade firmly on both sides providing additional lateral strength. The system minimises the handling of the blade when fitting and removing from the handle. Below is the full range of our dentistry blades and handles. There are no exhibitions related to this section. 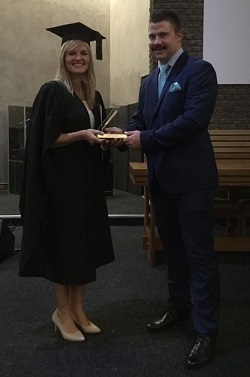 Simon van Heerden from Medequip has presented the 2016 Annual Swann Morton Veterinary Surgical Prize to winner Dr.Rosalia Bruggemann whilst Quenton Greene did the honours for the Dental Award presenting it to Dr.Guilmerme Rodrigues de Franca. Swann-Morton have been unveiled as the new UK distributor of the Qlicksmart safety products which will form a natural extension to their existing range of sharps safety solutions targeted at improving patient and staff safety in both acute and non acute healthcare settings .